The FDA-cleared device used in the procedure utilizes, time-tested energy of ultrasound to stimulate the deep structural support layers of the skin—including those typically addressed in a surgical facelift—without disturbing the surface of the skin. Now there’s a way to stand firm in the face of gravity—on your terms. With Ultherapy, there’s virtually no downtime, no foreign substances, no radical change; just a healthy revving-up on the inside for a natural, noticeable effect on the outside. 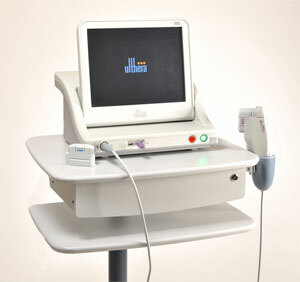 In some ways, Ultherapy is just like an ultrasound imaging procedure that expectant mothers may receive. A smooth handpiece is placed on your skin and an image of the tissue beneath is projected on a screen. This allows your practitioner to “see” where they will treat your skin. But here’s the difference: with Ultherapy, that same handpiece is also used to deliver tiny deposits of focused ultrasound energy at just the right depth below the skin, to the same foundational layer typically addressed in a surgical facelift. Your skin's response to this energy is to recondition tired skin by stimulating the growth of fresh, new collagen. The result is a possible tightening and gradual lifting—or shifting—of the skin back into a more youthful position and form-fitting shape. Natural. Non-Invasive. Possibly no Downtime. You are able to return to your normal activities the next day, and there are no special measures you need to take. Your skin may appear flushed immediately after the ultrasound treatment, but any redness should disappear within a few hours. It is not uncommon to experience slight swelling for a few days, or tingling/tenderness to the touch for a few weeks following the procedure, but these are mild and temporary in nature. There is the possibility for other less common post-procedural effects, such as temporary small areas of bruising or numbness, and other rare effects which your physician will review with you. Dr. Rahimi had personally performed over five hundred ulthera treatments since 2012. Individual results may vary, consult your doctor to make sure you are a good candidate for this treatment.